That's right: second cousin seven times removed, and to be complete we would say "with your husband in the descendancy." In specifying degrees of removal, one has to say which of the two cousins (Lyman Beecher or your husband) is farther from the common ancestor -- i.e., is "in the descendancy." 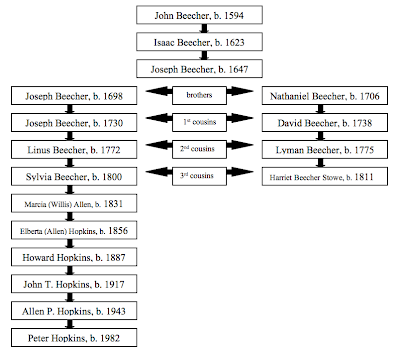 So on your chart, Lyman Beecher and Sylvia Beecher are second cousins once removed, with Sylvia in the descendancy. 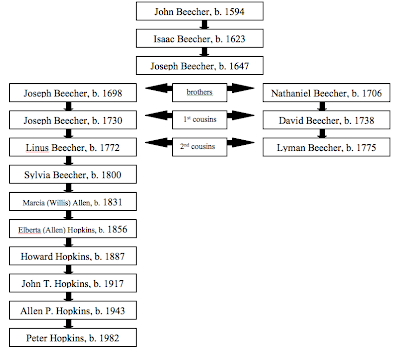 Lyman Beecher and Joseph Beecher (b1730) are first cousins once removed, with Lyman in the descendancy. Lyman Beecher and your husband are second cousins seven times removed, with your husband in the descendancy. I think these long links are great fun, and the serious point they show is how few generations it really takes to link together a whole continent or encompass vast ranges of history. From the Puritan migration to today is roughly 10-12 generations. I've seen an estimate somewhere and don't recall what it was now (so correct this if you know), but something like 50 million people in the US can trace at least one line back to the 20,000 who settled in New England from 1620-1640. Your husband probably has lots more to be found. Thanks for the confirmation and the tips. I'll definitely look into the "Notable Kin." We've spent most of this past holiday week investigating the family history, and as far as I can tell, my husband is related to every Yankee in Connecticut. The big question mark at the moment is whether we can follow one of his family lines back to the Mayflower. There's a promising connection to Giles Hopkins, but we have to document it more definitively. His 18th-century ancestors were Tories, and it's a bit tricky to trace them when they move to Canada after the revolution. I'll have to poke around and see if there's any way to connect the family to the Obamas — my mother-in-law would be tickled to death.